There’s a reason Duck Duck Goose is the fastest growing consignment event! 1. We all know raising kids is expensive! Why not save when you can and get great deals at Duck Duck Goose. Put the savings into a college fund, or save for a family vacation and build lasting memories while they’re young. 2. It’s easy to find like-new and even brand-new baby items at consignment. That’s the best thing about shopping for Baby at Duck Duck Goose: Clothes are typically outgrown before they are worn out. If you, or someone you know, is expecting a new bundle of joy, you can find great baby gear at Duck Duck Goose! From strollers, swaddles, and swings, to cribs, carseats, and carriers, we have it all under retail pricing! 3. You don’t have to sacrifice quality. At Duck Duck Goose, we strive to have excellent quality control and we make a lot of effort to putting only clean, unstained, tear-free clothes on our racks. Toys must have all their pieces as well as batteries if they require them. It matters a lot to us to take the extra step to make sure your shopping experience is a great one! 5. Be prepared for the next season! At our spring sale, shop for outdoor equipment, sandals, summer play clothes, Easter gifts and Easter outfits! Worn only a few times, Easter clothing comes to consignment looking new! In the fall, shop for warm winter coats, hats, gloves, and boots, back-to-school gear and clothing, Halloween costumes, Christmas gifts and more! 6. Duck Duck Goose is a great chance to get everything you need at one place. Clothes, shoes, swimsuits, coats, toys, bikes, electronics, sports gear and more! Prep your child’s closet and your birthday-gift stash all at once. If you don’t want to gift pre-opened toys, check out our Melissa and Doug section: All brand-new, in the box and discounted from retail pricing just for our customers! 7. You can volunteer for the opportunity to shop before the public sale! 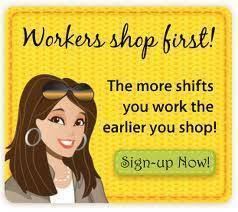 Join other volunteers and earn private shopping times to get the best deals before they are gone. Lines are shorter and shopping with co-volunteers makes for a fun experience. 8. Save even more on Half-Price Day. On Saturday, February 25th, everything without a red dot will be 50% off! Don’t miss it! If you haven’t tried us yet, don’t wait. Come On and Play at Duck Duck Goose!